Are you looking for countertops in Swanstone colors in Maryland, Northern Virginia, Baltimore, Columbia or the surrounding area? Swanstone is a leader in the countertop industry, offering consumers high-quality and durable products for very affordable prices. With an extensive collection of Swanstone countertop colors, you are sure to find a solid surface that accents your kitchen or bathroom. Keep reading to explore the various Swanstone colors and learn about new trends in countertop installation. If you’re ready to speak with our installation team and schedule a free estimate, give us a call at 410-712-0601 or click below to contact us online. Deciding on a color for your countertops is just as important as the material you choose. With the ability to open a small space or bring a focal point to the room, color is an influential decision to make! Seafoam Green: Looking for color? Opt for a brighter hue like Seafoam Green that adds excitement and life to your bathroom or kitchen. This is perfect for homes that follow a green color scheme as well! These are just a few of the Swanstone countertop colors available. Give us a call to speak with our installation experts and learn more about the options available. We can surely find a hue that compliments your home. 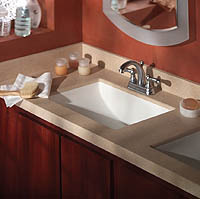 From Swanstone vanity tops to kitchen counters, we’re ready to give your home a facelift! Deciding to work with Express Countertops for your Swanstone installation ensures you receive top-quality products paired with top-quality service. We stand behind our One Week Installation Guarantee, meaning that your countertops will be installed within 7 days of your final decision! Our goal isn’t to keep you out of your own kitchen for weeks. We want to deliver premium Swanstone countertops and get you back in the kitchen before you know it! If you need more assistance selecting the right colors or materials, let us know! With skill and experience, we know the ins and outs of choosing counters that accent an entire room. Click here to learn more about Swanstone installation prices. Give us a call today at 410-712-0601 or click here to contact us online and schedule your FREE estimate with Express Countertops! Our installation team is ready to answer any questions you may have about the planning and installation process. If you are in need of support or consultation, we can help you choose the best products to accent your kitchen, bathroom and other countertop needs. Don’t wait any longer; give us a call today!